Rumors are already circulating that ABC’s The Family won’t be renewed for a Season 2, but I think it absolutely deserves more airtime. More: The Family: Who’s evil and who’s just misunderstood? Not only is the acting in the show phenomenal, but the story lines are also spot on. Sure, my theory about Adam turned out to be pretty much correct, but the predictability doesn’t really matter. It’s like a rom com — you know where the characters are going to end up. In a rom com’s case, it’s happily ever after; with The Family, not so much. But the point is the journey and the development along the way. And The Family delivers week after week. I think the reason the show isn’t getting great ratings is because the topics it deals with (child abductions and assaults) doesn’t exactly make for family-friendly television. I also doubt that most people want to spend their Sunday nights dealing with the trauma and fallout of these heavy issues. It makes waking up on Monday morning all the more daunting. I get it. But it’s so worth it to see this story unravel. I am blown away by the show’s ability to make me sympathize with Hank one moment and then be horrified by Doug (AKA ‘The Pockmarked Man’) in the next second. Also, the Warren family is so hateable because of their political ambitions, and yet I need to know what happened to real Adam for the sake of their family finally finding peace. OK, and because at this point I also feel the inner turmoil of needing to know. 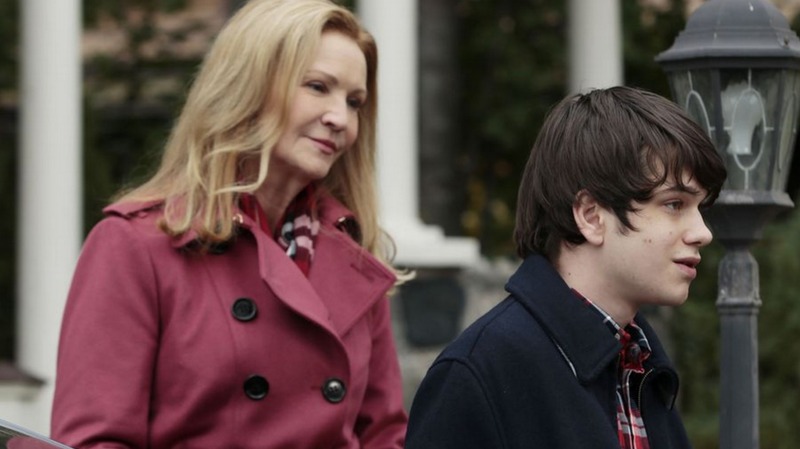 I mean, come on, just try and argue that Joan Allen’s acting on tonight’s episode as Claire Warren wasn’t Emmy-worthy! She is so brilliant in this show it’s scary. And part of the reason she is so brilliant is because she has a host of stellar actors backing her up in the show. Alison Pill as Willa Warren was also flawless tonight and Liam James as Adam/Ben is haunting. The mystery of this show also continues to be enthralling because the thriller aspect comes, not from wanting to see Doug caught (though that is definitely a factor), but from the constant suspense of who to root for. One minute, I’m against Claire and her political motives and the next second I’m questioning Willa and Adam. But the show is brilliantly written because all of the characters have justifiable, realistic motives that are fascinating to explore and discover. Ok, enough gushing. My point is, it will be an absolute disappointment to lose The Family if ABC decides to cancel it. Do you think ABC should cancel The Family or are you hooked on the show like me?